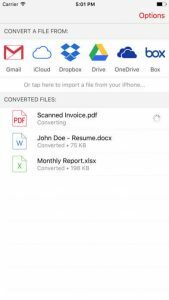 This transcendent PDF converter has proven to be our most revolutionizing app so far. Easily convert PDFs to Text, Word, Excel, JPG, PowerPoint, AutoCAD files, and back to PDF. PDF Converter Ultimate enables you to import files from Dropbox, Google Drive, Gmail, and other cloud services. Our OCR technology makes it possible to convert even scanned files. All conversions are done online on our servers, so this app will make best of your processor and RAM memory as well as save battery life. No limits on file size or number of converted files. Conversions are fast and accurate. Scanned and complex PDFs can be converted due to our leading OCR technology. You can convert Gmail attachments and files from Dropbox, iCloud, Google Drive, Box, and OneDrive directly from our app.